US Surgeon General Luther Terry's 1964 Advisory Committee report on Smoking and Health brought about significant changes for the tobacco industry, leading to far tighter restrictions on advertising as well as the addition of warning labels on packaging. As far back as the early 1950s, cigarette advertising had begun to attract controversy, yet tobacco companies continued to pour money into their marketing efforts. From the late 1870s, cigarette companies were able to strengthen their brands due to the invention of color printing, which heralded a new era for both advertising and packaging – including the placement of trading cards in individual boxes. When people began to express uncertainty about the health effects of smoking in the early 20th century, tobacco companies responded with a campaign to reassure the public about their products – and thus safeguard their industry. To this end, tobacco marketers got actors, athletes and even doctors to endorse their goods and make astonishing claims, with pseudo-scientific medical reports another staple of this strategy. These 10 vintage ads offer an opportunity to explore the attitudes of the day; and by today's infinitely stricter standards, many of them seem almost hilariously outrageous. Craven "A" began marketing its cigarettes under the slogan "For Your Throat's Sake" as early as 1939 – if not before. The brand, which is currently owned by Rothmans, Benson & Hedges, enjoyed huge popularity during World War II. Part of the reason for this is that cigarettes were donated to the war effort by the tobacco industry and they were included in soldiers' rations. By the time the war was over, many veterans were not only addicted, they were also loyal to a particular brand. When unsettling reports began to surface that smoking could cause lung cancer and other diseases, people began to wonder whether having a smoke was such a good thing after all. Suspicions about the negative health effects of cigarettes had already become ingrained in popular culture, with terms like "coffin nails" and "smoker's cough" part of people's everyday language. To protect their empires, tobacco companies began an all-out campaign to convince people not to abandon their smokes. 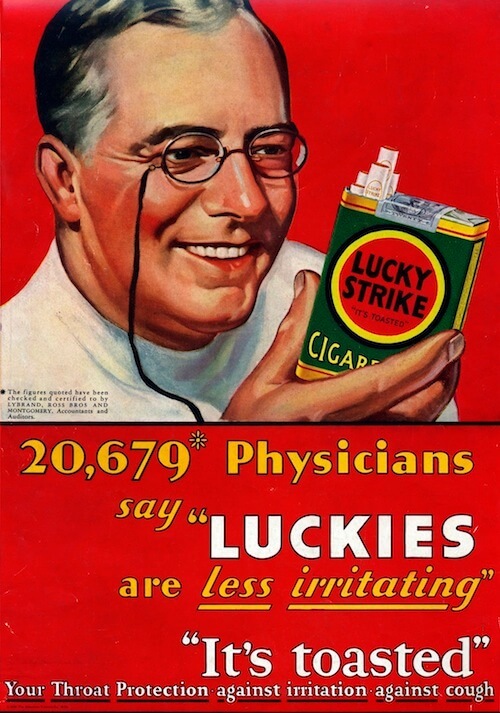 Lucky Strike ads communicated a variety of messages, from the idea that toasted cigarettes are less harmful to your throat and reduce coughing, to the suggestion that their products could lead to noticeable weight loss. "When tempted to over-indulge, reach for a Lucky instead," says the 1930 Lucky Strike advertisement pictured above. Although advertisers can no longer claim that smoking keeps you slim, in decades like the â60s and â70s women were targeted with ads that promoted smoking as being somehow glamorous. Worrying research carried out by London's King's College predicts that female lung cancer rates will triple over the next 30 years, because incidences of the disease are generally a sign of people's smoking habits three to four decades earlier. For more than 50 years, tobacco ads focused on dispelling growing fears that cigarettes have a negative impact on health. By the time the US Surgeon General published the report of 1964, the detrimental effects of tobacco were well documented. Over 7,000 scientific studies connected smoking with emphysema, heart disease and various other conditions, and a causal link was made with lung cancer. In the years before the Surgeon General's report, tobacco companies did their best to bury the truth. They found doctors willing to justify the brazen claims made by their ads in exchange for fat payments worth almost half the physicians' annual salaries. The 1940 Philip Morris advertisement pictured above is a prime example of a cigarette company making ludicrous claims supposedly backed up by science. In the words of professor of otolaryngology Robert Jackler, MD, tobacco "companies successfully influenced these physicians not only to promote the notion that smoking was healthful, but actually to recommend it as a treatment for throat irritation." This 1946 advertisement claims that "more doctors smoke Camels than any other cigarette." According to research carried out by Stanford University, R.J. Reynolds, the company behind the Camel brand, paid to have surveys carried out at medical conventions. In order to skew the results, doctors were given free packets of cigarettes; then afterwards, they were questioned about either which type of cigarettes they had in their pockets or which brand they liked best. The 1920s and 1930s saw a new wave in cigarette advertising: celebrity endorsements. Lucky Strike used this tactic extensively. The 1931 advertisement above features Edmund Lowe, who was a prolific actor at the time. In exchange for his endorsement, Lucky Strike provided publicity for three of Lowe's films. The partnership between celebrities and cigarette brands encouraged individuals – especially young people – to associate cigarettes with glamor and an elite lifestyle, while the products' negative effects were trivialized. In the following decades, tobacco companies further targeted the younger generations by ensuring that cigarettes figured prominently in cartoons and popular TV shows. For example, The Flintstones used to be sponsored by Winston cigarettes, and Fred and Wilma could be seen lighting up at the end of episodes. Regulations introduced in 1964 prohibited advertisements that targeted young smokers, but some contend that advertising ploys featuring appealing characters such as Joe Camel were simply subtler means to the same end. Ironically, Lowe died of lung cancer in 1971. "L&M Filters are just what the doctor ordered," claimed this 1951 L&M Filter Tip ad – despite the fact that tobacco factory chemists knew that filters had no more effect in removing nicotine and tar from cigarettes than the same amount of tobacco. Reader's Digest articles further publicized claims that filters could be effective in this way. Tobacco companies hosted dinners at fancy restaurants for throat specialists, where the practitioners were encouraged to recommend cigarette brands to patients with coughs and other complaints. Furthermore, even after the 1964 Advisory Committee report, leading medical experts still testified in favor of the tobacco industry. The fact that many major otolaryngologists testified before Congress against the Surgeon General's findings is alarming. 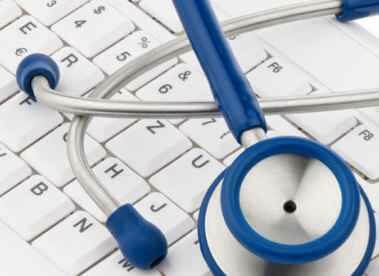 For Robert Jackler, this serves as a caution to current health professionals. "Ethically, a physician must always act on behalf of the well-being of patients," he says, adding: "Responsible industries balance their need to maximize profits with a commitment to improve the health of their consumers." The Lucky Strike advertisement pictured above was launched in 1949, and one of the models used in the campaign, Janet Sackman, was only 17 at the time of the shoot. According to Sackman, an older tobacco executive present at the shoot encouraged her to start smoking so that she would know "how to hold a cigarette." She picked up the habit and suffered from throat cancer in later years. In this ad, steel-nerved oil well firefighter "Pat" Patton endorses Camel cigarettes "for digestion's sake." Run in 1937, the ad was part of a campaign that claimed smoking Camels assisted digestion by increasing the movement of alkaline digestive fluids. Eventually, the Federal Trade Commission sent a cease-and-desist order to the R.J. Reynolds Tobacco Company, forbidding them from representing Camels as being beneficial to digestion. Unfortunately, this didn't happen until 1951 – more than 10 years after the advertisements had stopped running. Since 1964, even more stringent restrictions have been introduced – including the June 2009 FDA Tobacco Regulation Bill, which gave the Food and Drug Administration extensive power over industry products, labeling, ingredients, and the size of the warnings on packages. Claims like those featured in this 1929 Lucky Strike advert are now a thing of the past. The campaign, which was launched in 1928, encouraged women to "reach for a Lucky instead of a sweet," and it proved very successful. It was, however, brought to a somewhat amusing end thanks to legal threats from the candy industry. Even the names of some cigarettes (like Virginia Slim) could impart unconscious messages to potential female consumers. This 1949 advertisement for Viceroys featured a dentist instead of a general physician or otolaryngologist to suggest that smoking is okay. Perhaps a dentist was used in this case to ensure that there were a variety of different healthcare professionals extolling the virtues of cigarettes. Yellow teeth and bad breath are unattractive side effects of smoking, but if a dentist is recommending Viceroys, then cigarettes can't be all that bad, right? Although increasingly stringent regulations have put constraints on the tobacco industry and the days of false health benefit claims are gone, the battle is far from over. In fact, in 2008 the US tobacco industry forked out nearly $10 billion on advertising and promotional efforts. The question, then, is how can health administrators further leverage their power against the industry – and thereby save lives?